My Body, My Pace, My Choice. An artsy gal's budget guide to endurance. So I turned 30... yay? Now the marking on my calf will match my actual age. There are generally a few benefits to getting older. When you're little, you can't wait to get older, so you can do big kid things. Get a little taller, so you can ride scary rollercoasters, age into PG-13 movies, R, arrive at the age of voting, drinking... but after 21, really the only landmark left is being 25 so you can rent a car. Unless you're a politician, which I am not, after 25, getting older ceases to be exciting, and starts to get depressing. Is it also so in multisport? As an age grouper, I thought perhaps I'd have better odds getting older-- one might think that a younger member of the 30-34 group would fare better. Young is better, says our culture. Not so in triathlon. Like wines and cheeses, age groupers only get better as the years progress. Recall I podiumed at 29 in my 25-29 group. When I started this sport, I was totally clueless. Four years of cutting my teeth and saving money for a bike, I could finally live up to my potential. And now I'm aging into a group of INSANELY fast women who already own totally sick bikes, it seems. To illustrate: last year's first place 25-29 female age grouper was a giant TWENTY minutes slower than the first place finisher in 30-34. This year, FIRST place overall female was from my age group. Uhhhh... crap. So either I REALLY up my game or I lay low for four years and wait for people to get slow or have babies? Guess it's up my game time. Luckily... I already have. With bonafide coach D on my side, I've been hitting the training like nobody's business in prep for Vineman 70.3. Just registered for Ironman Cozumel, so that's officially on. And my most prized 30th birthday gift? RACE WHEELS!! Oh yes, my friends. It is most definitely on. So I should be able to keep pace with those speedy 30-somethings, for I, too, am now a speedy thirty something. 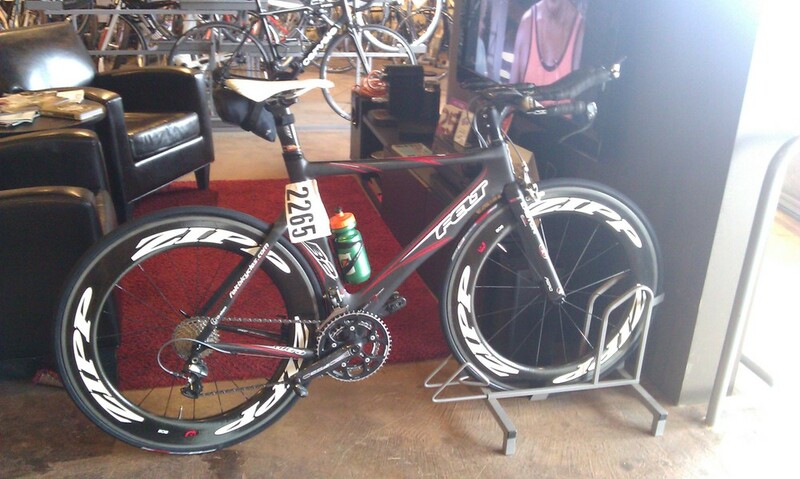 Grane with gorgeous Zipp Firecrest 808s!!! Eee! I'm especially excited about these wheels, since they handle well in wind. (Crosswinds on an aero frame, so scary, even more scary with race wheels... UNTIL NOW!) The Firecrests are specifically designed to stabilize in crosswinds. From my rides so far, I can definitely feel the difference... yes, the wind still pushes you, but then you feel the bike kind of push back almost. It's really cool. Cozumel is supposed to be very windy, so I feel like I now have a secret weapon on my side that will let me attack that course like a bike ninja. I'm excited to test it out on the rollers in wine country. Bring it. Turning 30 ain't so bad when you feel good physically, and it was extra fun once I rallied my friends. Jeff and Lisa, LA Tri Club buddies extraordinaire, offered their house up for party central, and all of my nearest and dearest in LA showed up (well-- those who could make it, at least.) It was so nice to see everyone under one roof, old Princeton friends, theater and comedy friends, and, of course, scores of triathlon buddies too. One of my birthday presents was a cake from Michael Wimer, who decorated it with all my previous races. He wrote "Cabo" extra crappy on purpose, since it was such a crap race. On the side it says, "Bring on Kona". Yeah! That's what this decade is for: awesomeness. I'm about four weeks out from my next race-- well, the next A race... I randomly signed up for Breath of Life as a "C" race this weekend. That'll be my first Olympic in years! Will be fun to see. It's a little Team Awesome reunion, so we gotta represent at least moderately! 2 more weeks of peak, 2 weeks of taper, and wine country away. Kinda excited to see how I do on the fanciest of fancy bikes with a good training program and real rest. I'm already in better shape now than I was last decade. Let's do this thing!